You submitted your offer to GSA many months ago, and after a protracted period of waiting, you finally got your GSA number. Naturally, you will feel happy and excited, but this is when the important work begins. After all the excitement has settled, you should take some critical first steps to ensure a successful contract launch. Without a solid plan, your chances of acing a sale are near zero. The government can be your major client, but selling to them will be difficult without a contract administration plan and a federal marketing strategy. 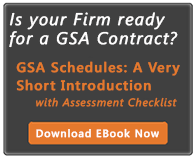 Below are some helpful tips to begin succeeding as a GSA contractor. They are pretty simple, and once you have them implemented, you are on your way succeeding as a GSA contractor. The award email from your CO outlines all the task you need to complete in the near term, usually within a month. After receiving the contract award, immediately review the award letter, identify all the listed GSA tasks and respond to them promptly. Have a member of your management team around when reviewing your award letter so that appropriate resources can be applied. Managing a GSA contract is not intuitive. No employee has any instinctual knowledge on what to do, so don’t leave your contract administrator hanging. While GSA’s “Steps to Success,” and other documents on the GSA Vendor Support Center provide some information, it takes forever to go through. Most find the information to be quite general and unhelpful performing actual tasks. If you want to provide a practical training program that can be referenced over time, the GSA Contract Management for New Vendors online course is a good place to start. Orders don’t flow simply because you have a GSA contract. You must have a strategy and well-informed staff to pursue the market. Does your team have the knowledge to develop a go to market strategy? Do they know how agencies make purchasing decisions? Do they sit back and await RFPS or do they proactively create opportunities? Your sales and marketing team should have a thorough understanding of the Federal Buyers Journey. As stipulated by GSA clause I-FSS-600, all contractors are required to prepare and submit a GSA price list. GSA gives you six months to upload your GSA pricing to GSA Advantage. But you don’t have to wait that long before uploading your GSA pricing. In fact, the earlier, the better. Nobody will contact your business if your price list does not appear on GSA Advantage. You will not have access to eBuy’s RFPs until you do. Before deciding on who do business with, clients often conduct an intensive research, and they often turn to the internet to do this. The reason why you need a website is that it will serve as a portfolio for you. Ensure your GSA schedule and other helpful information is outlined on your website. Check out this free eBook on making your website more accessible to federal agencies by including federal marketing information. Put out the word about your GSA award. The most cost effective way of doing this is through press releases and mailings. Strive to get the attention of the federal media through several press releases. Be sure to mention all important information federal buyers would need in your press releases. Succeeding as a GSA contractor starts taking important steps early, and enabling your team to perform their job. The above tips will help you start off right.